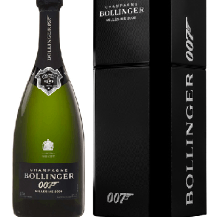 To celebrate the new James Bond film Spectre, we have this delightful Champagne from Bollinger. This limited edition is made from Pinot Noir and Chardonnay grape and is produced in small old oak barrels to give it a lovely fresh crisp taste. Bollinger's 2009 Millésime Edition Limitée 007 has a very clear, fine and fruity bouquet that reflects a perfect blend of Grands Crus dressed with Pinot Noir (68%) and Chardonnay (32%). Fermented in small used barrels and disgorged in February 2014, the 2009 is very elegant, intense and balanced on the palate; it reveals a remarkable finesse with fine pearls and sweet cherry-flavored fruit. Its finish is well structured and quite powerful and fruity, though it keeps the elegant style. Could be drier for Bond, though that's for the girls, isn't it? Back to the facts. Here's how Bollinger comments on the 2009 harvest: "Favorable weather conditions allowed the vines to bud mid-April, slightly early compared to the average of the past ten years. Flowering was disrupted by rain and cool temperatures. Early summer was marked by a succession of violent storms that raised concerns of vine health. As of August 1, there was uninterrupted excellent weather until the harvest, which ran from September 12 to 27 with idyllic temperatures. The average potential alcohol for Bollinger reached 10.1° with an acidity of seven grams per liter." Sourced exclusively from Grands crus from the Champagne region, the juices selected are taken from the ‘cuvée’ retaining only the best of the grapes. The «Bollinger Spectre Limited Edition » blend is composed of 68% Pinot Noir and 32% Chardonnay. For Pinot Noir; Aÿ 39% and Verzenay 29%.